Never, ever cry…Eureka Boudreaux’s mother drilled that rule into her daughter years ago. But now her mother is gone, and everywhere Eureka goes he is there: Ander, the tall, pale blond boy who seems to know things he shouldn’t, who tells Eureka she is in grave danger, who comes closer to making her cry than anyone has before. But Ander doesn’t know Eureka’s darkest secret: ever since her mother drowned in a freak accident, Eureka wishes she were dead, too. She has little left that she cares about, just her oldest friend, Brooks, and a strange inheritance—a locket, a letter, a mysterious stone, and an ancient book no one understands. The book contains a haunting tale about a girl who got her heart broken and cried an entire continent into the sea. Eureka is about to discover that the ancient tale is more than a story, that Ander might be telling the truth…and that her life has far darker undercurrents than she ever imagined. I was really intrigued with Teardrop, and I like that it’s a modern re-telling of Atlantis. Raising Atlantis is pretty unique, and while I feel like it’s come up before in books I’ve read, I don’t think I’ve ever read anything where Atlantis comes back. There’s a lot going on, and there were times when things didn’t make a lot of sense, but as the story unfolded, everything started to fall into place, and you begin to understand why people did the things they did, particularly Ander and Brooks. I really liked that Ander and Eureka were on opposite sides, but that he did everything he could to protect her and keep her safe. There is a love triangle in Teardrop, and unlike most books that feature love triangles, there is no clear love interest yet. I actually really like that it’s not clear who she’s going to end up with (since move LT’s are super-obvious) and that it could go either way. Given the love story between Leander and Selene that caused Atlantis to be banished, and that it very much connects to Ander and Eureka…and even Brooks connection to everything…I honestly don’t know which way I want it to go. While we don’t get too much on Atlantis in this book- only why Atlantis disappeared, and the people it left behind- I really hope we see more of Atlantis and what kind of place it was in the coming books. And I want to know more about the Sandbearers and Selene’s line! I have so many things I want to know. I really was surprised by so many things that happened, and Kate did a great job at revealing things at the right time. It kept me guessing, and I liked that I wasn’t completely sure what was going to happen next. 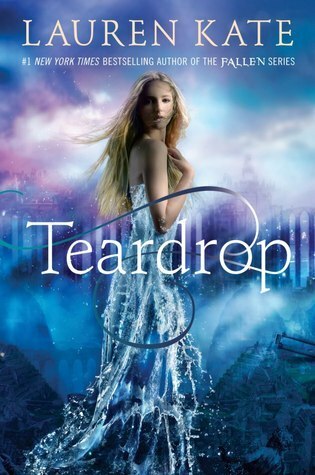 I really liked Teardrop, and I can’t wait to see what happens next! Teardrop gets 4 stars.